Because sometimes I do things that are interesting. I was invited to join a dream team of game industry veterans for this year’s Global Game Jam event in Ottawa. The idea is you have 48 hours to create a video game based on a secret theme revealed Friday night. The theme this year was “Ritual”. Not bad for 2 days! 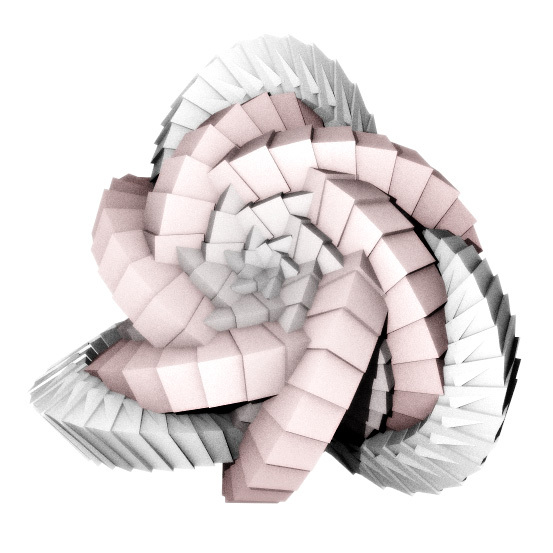 I’m working on a lightweight computer vision algorithm for Robotgrrl’s Robot Missions project, and I’ve been exploring neural networks and learning machines on low-power hardware. 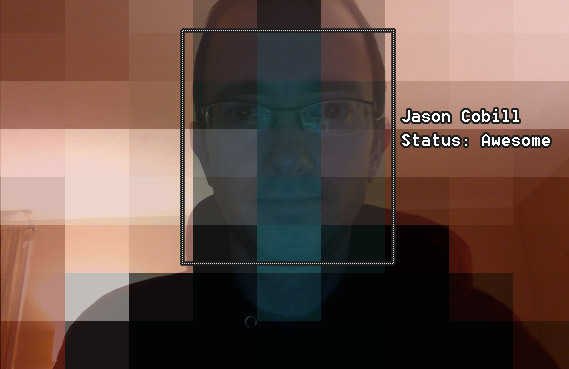 This is a simple regression tool that breaks an image down into 64 samples and tries to determine which pixels are Jason (blueish) and non-Jason (reddish). It works surprisingly well in ideal situations! The end goal is to create a feature identification tool that could help a robot navigate around rocks or branches or penguins. I’m doing some R&D on a project where I’ll be helping some dancers become ‘feral’, letting their animal spirits out using some digital trickery and projection mapping. 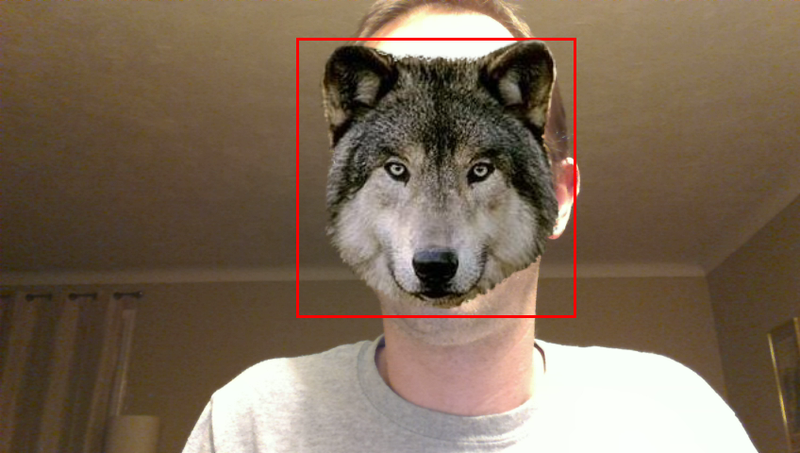 This is a fun step in my exploration – I’m using the excellent OpenCV library in Processing to recognise faces in a webcam video (the red box) and replace the faces with a super terrible “wolf mask”. 🙂 The end result is going to look a lot better than this – what’s exciting here is that it works at all. Can you believe real time facial recognition is possible on a tablet PC? We live in the future! 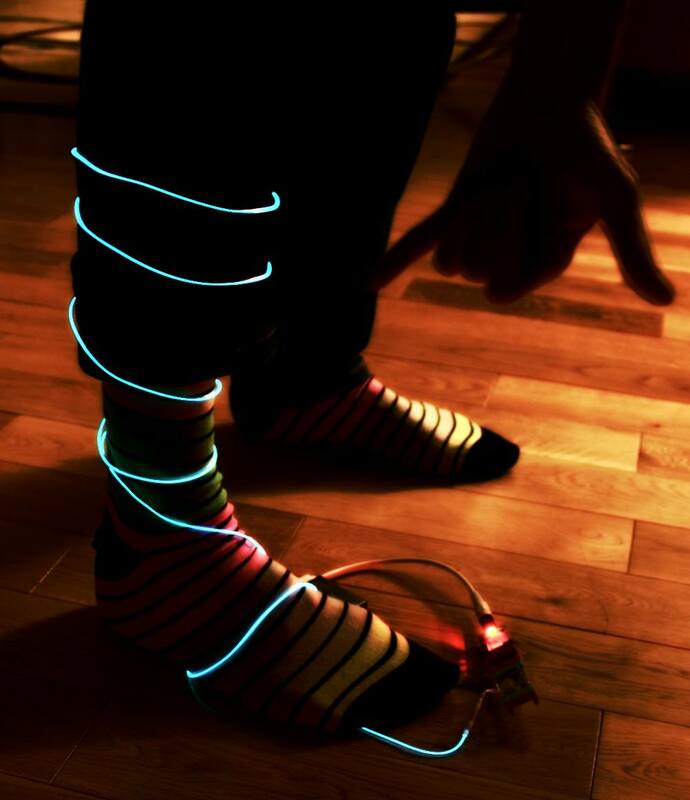 I rigged up some Electro-Luminescent wire and a pressure sensor that triggers when I take a step – my pants are a party! 🙂 Hoping to get these looking a bit more refined before a glow-light event coming up in July. Also, yes, those are my amazing neon striped socks.